Kliknij na zdjęcie i przejrzyj wszystkie dostępne zdjęcia do Cabaña Media Luna. transfer z lotniska, transfer lotniskowy (dodatkowo płatny), ogród, taras, pokoje dla niepalących, pokoje rodzinne, zakaz palenia obowiązuje we wszystkich pomieszczeniach ogólnodostępnych i prywatnych, część przeznaczona dla palących. 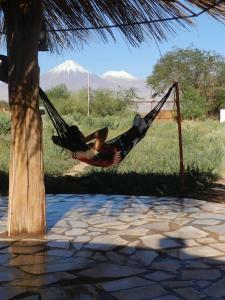 Featuring a garden, Cabaña Media Luna offers self-catering bungalows in San Pedro de Atacama. The bungalows feature a seating area, private bathroom and a fully equipped kitchen. Some also have satellite TV. Mountain views can be enjoyed from here. At Cabaña Media Luna guests will find a terrace. The property offers free parking with prior reservation. Cabaña Media Luna is located a 20-minute walk away from the town's centre. Calama Airport is a 1-hour drive away from the property. Please note towels will be changed on the third day of your stay. Breakfast and a daily maid service are not provided in this property. This additional fee (IVA) is not included in the hotel rates and must be paid seperately. Please note that the check-in and key-collection take place at: Volcan El Tatio 703 - Hostal Sumaj Jallpa, 1410000 San Pedro de Atacama. Please inform Cabaña Media Luna in advance of your expected arrival time. You can use the Special Requests box when booking, or contact the property directly with the contact details provided in your confirmation. A damage deposit of USD 100 is required on arrival. This will be collected as a cash payment. You should be reimbursed on check-out. Your deposit will be refunded in full in cash, subject to an inspection of the property.